This post was written by peterjmurray on January 21st, 2016 10:14 am Comments Off on LOTS OF FUN FEEDBACK! Just recently we’ve had lots of lovely feedback from our fans at various schools. It makes our job so much more worthwhile. So keep those e-mails, letters and suchlike flooding in…we can’t get enough of it! 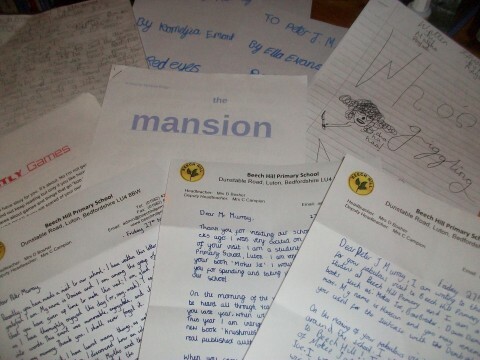 We received four wonderful letters from Hassan, Denisa, Salsabil and Iffat of Beech Hill Primary. Apart from the beautiful handwriting, each of the letters was extremely well-written and VERY complementary about our books and visits – so a BIG ‘thank you’ to all of you. We also received some great stories from Madison Briggs (THE MANSION), Jack Pounder (GHOSTLY GAMES), Ella Evans and Komelyia Emonite (RED EYES) and Malika Anyadi (WHO’S GIGGLING NOW!). Some great authors to watch out for in the future. Again, a BIG ‘thank you’ to all of you for scaring me so much with your amazing imaginations! Got a lovely e-mail from Katie in Jersey who still remembers my Mokee Joe presentation from almost eight years ago. The school was the Jersey College for Girls Prep School. Coincidently, I’ve been invited back to Jersey in the summer and will definitely get in touch with the school. Thanks, Katie, for getting in touch. It’s extremely flattering to think that you still remember my visit after all this time – good luck with university. Oh well. Kath and I are off to Winchester now to have a look around and I’m going to seek out Izaak Walton’s Chapel in the cathedral. Can any of my fans work out the connection? It may have something to do with an interest of mine, and for once…it’s not scary!